Direct from a private estate in Chianti, in the heart of Tuscany, and produced from olives hand-picked from select groves in the hills of Valdarno, this treasured oil awaits you. The traditional Tuscan olive varieties Leccino, Frantoio and Moraiolo combine to produce a fruity and spicy oil with aromatic notes of artichoke, almond and fresh cut grass. 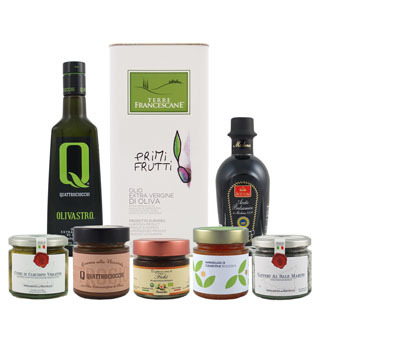 The elegant and practical black glass bottle protects the Classico extra virgin olive oil while also making an ideal presentation that complements any refined gourmet experience. From their private estate nestled among the cypress trees in the heart of Chianti in Tuscany, Pietre al Monte creates some of the most exclusive, exquisite extra virgin olive oils in the world. The estate is situated on lands inhabited since before 400 CE, and the company continues to restore ancient stone buildings on the land, with goal of transforming the space into a sanctuary for countryside living. Restoring and expanding ancient olive groves remains another high priority, as the region’s soils and microclimate combine to create the ideal conditions for producing pristine olives. All farm labor is done by hand following traditional and natural methods, with the olives crushed using a cold extraction process that results in pure, intense, pungent oils full of polyphenols and antioxidants. The oils of Pietre al Monte are truly a Tuscan treasure.